Theodora Fitzgibbon was born in London and educated in England and France. She was the author of more than 30 books, most of which were about food, and included her encyclopedia The Food of the Western World, which took her 15 years to complete and covered some 34 countries and 32 languages. It won the Glenfiddich Special Gold Medal in 1976 and in 1987 she was awarded the Prix Choucroute First Prize for European Food Journalists at Bonn. Probably her best known book is A Taste of Ireland. She also published two volumes of autobiography, With Love (1982) and Love Lies a Loss (1985). She died in 1991. 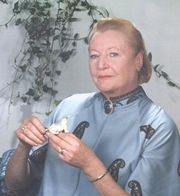 Theodora FitzGibbon is currently considered a "single author." If one or more works are by a distinct, homonymous authors, go ahead and split the author. Theodora FitzGibbon is composed of 4 names. You can examine and separate out names.